The fact is already before the world about how the pace of economic, social and cultural development of DPR of Korea has been getting accelerated in an unprecedented manner under the dynamic leadership of the Great and beloved leader of the entire Korean people, President KIM IL SUNG. The historic event of how Korea and the Korean people have emancipated themselves from the situation of dependence on others under the far-sighted policy and dynamic leadership of the Great Leader President KIM IL SUNG who believes in the fact that the progress of the country is possibly only through the spirit of dedication to duty, labour and wisdom of the Korean people themselves is not unknown to anybody. No one is unaware of the evershining truth that the pioneer role which the Great Leader President KIM IL SUNG played in the socialist reconstruction of the country having smashed conservatism, inertia and mysticism now stands out as a Distinguished page of history in the annals of the world. There is no exaggeration to maintain that the courage shown and sacrifice and peerless contribution rendered by President KIM IL SUNG in tiding over any difficulty and troubles for the overall development of the country and the people have been enshrined in golden words in the memorable pages of the history of Korea. It is the far-sighted policy and able leadership of the Great Leader President KIM IL SUNG that have played the mainly instrumental role in arraying Korea and the Korean people in an atmosphere of independence after having incessantly fought against Japanese and U.S. imperialism. The heroic role played by the Korean people under his revolutionary leadership too occupies a place of pride in the history of Korea. There cannot be two opinions about the fact that the brave activities and the struggleful life of the Korean people equipped with revolutionary ideals constitute the main background of the speedy and large scale progress of Korea. The fighter’s role which the Korean people developed and consolidated in the struggle for their country’s independence without wavering even in the least in fact of the having full faith in the ultimate victory through the adherence of the principles of mutual and directives enunciated by President KIM IL SUNG and the Workers Party of Korea during the course of struggle has become such an immortal part of history which will continue to inspire the entire peace loving people of the world. As a result Korea has begun to move ahead on the road to building up a communist society. Inspired always by the political personality of the Great Leader President KIM IL SUNG who is accustomed to the ways of a revolutionary family life are putting in untiring labour for the larger development of Korea has created a situation when Korea has been achieving new heights every week on the road of development. There will be no exaggeration to claim that the all round progress achieved by the Korean people as a result of the far-sighted leadership and fatherly affection of President KIM IL SUNG has placed the country very much ahead of many Asian countries. He loves his people very much in the same way as does his own children. The sentiments, gratitude and esteem expressed for him present at a living example of how much the entire Korean people are impressed by the personality of President KIM IL SUNG who has never alienated himself from the feeling that the weal and woe of his people are his own weal and woe. The unprecedented progress achieved in the field of education, agriculture, industry, culture etc, under the dynamic leadership of the people’s beloved leadership President KIM IL SUNG has brought Korea in line with the other developed nations of the world. 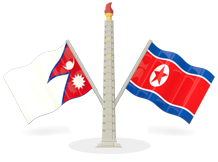 While on a visit to Korea we personally realizes that the speedy progress which is being made by Korea in accordance with the principle and the pace of Chollima being practiced under the leadership of President KIM IL SUNG of the Democratic People’s Republic of Korea had become an imitable lesson for all developing countries. What we witnessed during our tour of different parts of Korea proved that Korea had in fact become well established and developed. The Korean people have now become not only able to fulfill their essential needs but are also making tremendous headway in the direction of attaining self reliance. Consequently, the Korean people are today free from problem of unemployment. However, the entire working people have received the opportunity of choosing professions of their own propensity and in keeping with their desire and ability and enjoy full state guarantee for the security of their job. The entire Korean people, having full faith in the Juche ideas are determined to undertake full responsibility without any discrimination. Work has been going on in the connection in Korea. We are confident that the contributions which the ideological unity and technological and cultural revolution have rendered in augmenting production and accelerating the pace of progress at the chollima pace will go a long way in further consolidating the gains of the Korean development in the future. It is under the far-sighted and dynamic leadership of President KIM IL SUNG that Korea has attained full national independence, economic self reliance and ability to defend itself without obtaining any foreign assistance and has marched ahead at the Chollima speed, thus turning itself into an internationally recognized developed country. DPRK has succeeded in making progress in the field of industry along the socialist pattern. It has similarly been able to fully mechanize the agricultural field. This apart, during our visit we came across living examples of how the state has made all necessary provisions to systematically raise the living standard of the Korean people in all fields. The credit to all this goes to the Great Leader President KIM IL SUNG. It is the result of this contribution that the entire Korean people are today prosperous and happy. We had noticed the record of the tremendous progress made in the field of education during our visit to Korea and we found that the country had gone further ahead in those fields when we visited Korea again. The entire Korean children have been provided with all modern facilities and DPRK is the only country in the world where education is completely free. It is thus the Land of Education. There are provisions for the welfare of the old people and the womenfold too and they have been emancipated from various problems. To be true, the society of DPRK has become free from all kinds of exploitation, which is a great victory for the entire Korean people.